If you have been granted a deferred or supplementary examination read this information carefully. All supplementary and deferred examinations will be held at the University. Your exam timetable is published on studentConnect at least 10 days before the exam period. Timetable information is not available over the telephone. If you have misread the timetable and missed your scheduled exam you will be unable to sit the examination in the next session. Eligibility for special considerations is based on the guidelines outlined in the University Policy on Special Consideration and is assessed on a case-by-case basis. Your personal exam timetable (published on studentConnect) will display the date, time, venue and seat number within the venue for each of your exams. A list of student IDs and seat numbers will be displayed at the entrance to the exam venue. 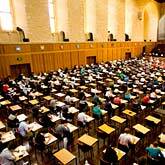 Exam periods for Deferred and Supplementary exams. You should arrive 15 minutes before written exams and 20 minutes before practical exams. If you are up to 30 minutes late you can sit the exam but you will not be granted extra time. If you miss an exam contact Student Administration immediately. If you pass your supplementary exam you will receive a grade of PS (Pass Supplementary). No mark will show on your record, however a mark of 50 per cent will be used to calculate your weighted average mark (WAM) and grade point average (GPA). If you fail your supplementary exam you will receive a grade of FS (Fail Supplementary). The original mark will show on your record and be used to calculate your weighted average mark (WAM) and grade point average (GPA) you received.